imagination, a creative bent of mind (Mount of Moon) and a higher than average intelligence. His hand is balanced, showing that his physical side is balanced out by the power of his heart and mind. Check out a hand photo of his right hand here and the left hand here (He is left handed). His thumb, which shows average will-power, tells us of his impressionability and the Jupiter finger of his idealism. Idealism will colour all aspects of his life, making him seek meaning in the work he does. This in fact is his driving force and not money or power. The Heartline on both his hands is long and deep, showing a deep capacity to love, confirmed by the strong Mount of Venus. However in some photographs his Heartline seems broken (on his left active hand) but without clear pictures I cannot comment on this. Jackman has a more sentimental approach to love than the average person, with less of an emphasis on the physical aspect of it and more on the idealistic and mental aspects. His physical passions are normal, nowhere near as high as he exudes on screen. The persona he projects on the screen is that of a highly sexed man, but his hand does not confirm that. Lucky for his wife, because an excessive libido when combined with impressionability and love of beauty is a potent combination for someone with average will-power. It would have meant a constant struggle against temptation, like it was for Tiger Woods. But Jackman can never be a Tiger Woods as long as he loves his partner. He believes in the idea of love. Jackman is not what he appears to be in more ways than one. He is aggressive, but this high aggression should ideally be matched by resistance as it makes a person's aggression effective. Jackman is at heart a vulnerable soul. He tends to be a little dreamy and idealistic sure, but what is more significant is that he cannot stand up to adversity that well. He is the kind of man who will bluster and bluff and then back down if pushed hard. People like him usually lean on a strong partner. They need the support. 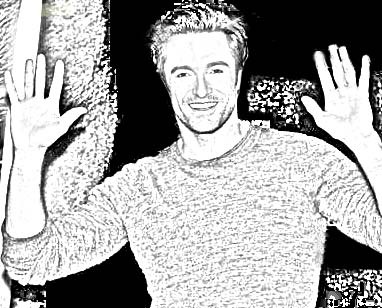 Jackman's hand also shows that he not very straightforward. This is probably a coping mechanism developed to cover up his vulnerabilities. This quality has increased from what he had inherited. Without better photos of his left hand it is difficult to say more. 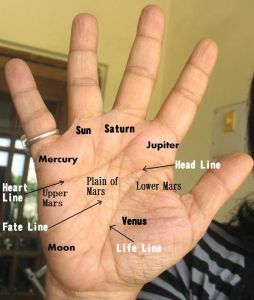 Or you can check out the hand analysis of other Hollywood actors or Bollywood actors. Not being straight forward is always done to cover up ones vulnerabilities - Well said there, Nita. In some places I had said Jackson, sorry. It was a typo because in the heading I had the right name. I have made the corrections. Thanks for pointing it out. I like his movies very much, what do you mean by "Not very straightforward" does it mean he is manipulative ? No I did not mean manipulative. I just meant that he is not always straightforward! :) And ofcourse he is a good person. He has got so many great qualities! And what a fantastic heartline which iteself shows the kind of man he is. But no one is perfect. Just want to add that it was not possible to get good photographs of Hugh Jackman's left hand. As he is left handed, his left hand will show his current personality. His heartline looks broken in one of these photos but I cannot be sure so I have mostly restricted myself to reading from the shape of his hand. It is a limited reading and I cannot really say much about Jackman. Thanks.BTW when you meet strangers do you try to sneak past their hands given your skill set ? it possibly takes hours before we can come any conclusion about personality traits but some basic information can be obtained easily. I'm just curious. yes ofcourse I do that all the time. I am continuously looking at hands. Not just when I meet people but also when I am watching movies or television. True, I cannot make out much but when some hands have some stand out feature, it sort of leaps out at you.